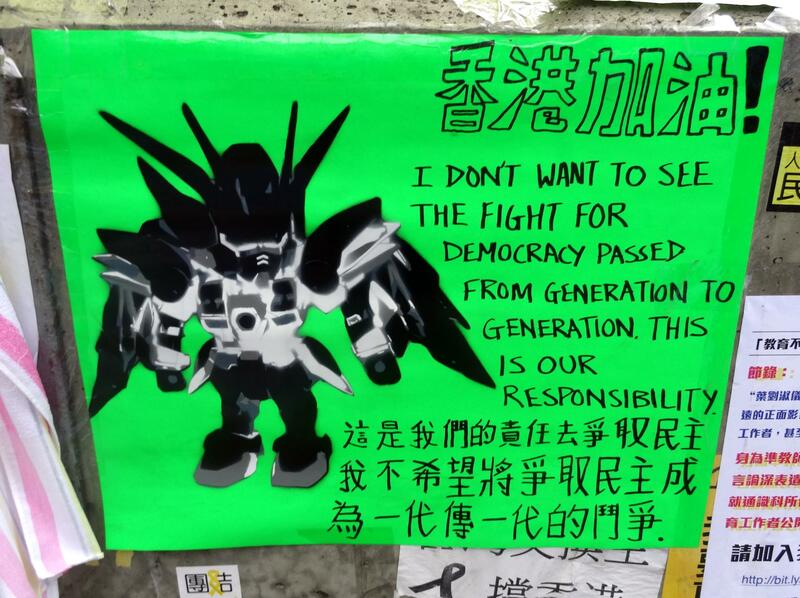 Last night, protesters in Hong Kong decided to shut down the government. They surged out of the Admiralty encampment they've held since late September and encircled the government offices and office of the Chief Executive. It was a desperate escalation. 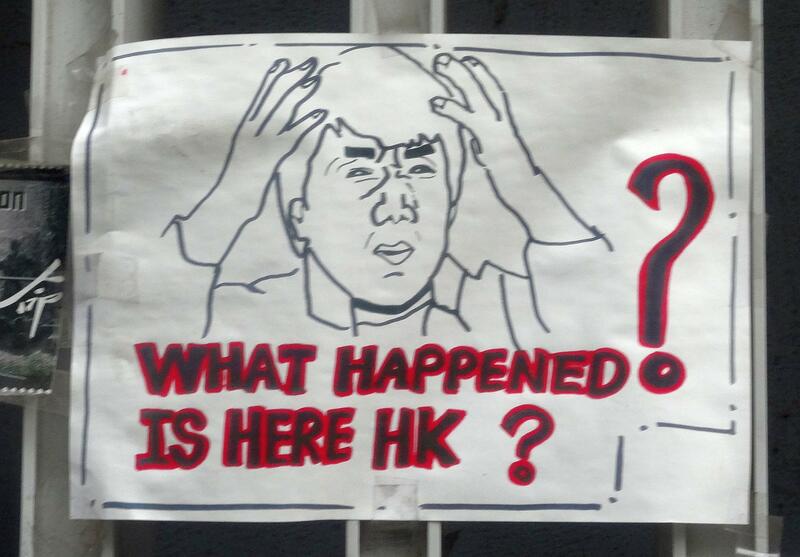 Last week, the police cleared their protest site in Mong Kok. Protest leaders contradicted each other. 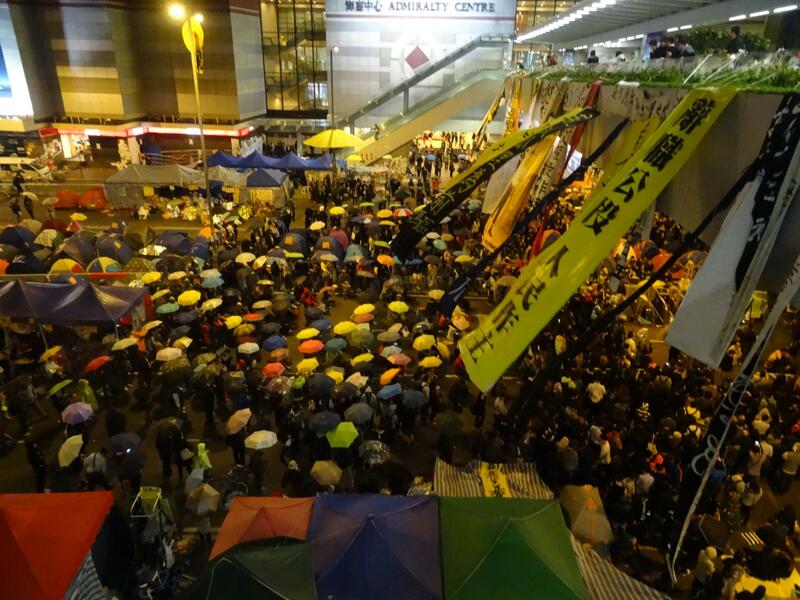 Breaking their weeks-old truce with the cops read like a last gasp before the umbrella movement folded. One more push to win Hong Kong the democratic elections promised during the handover from Britain to China. Police raised red warning banners. 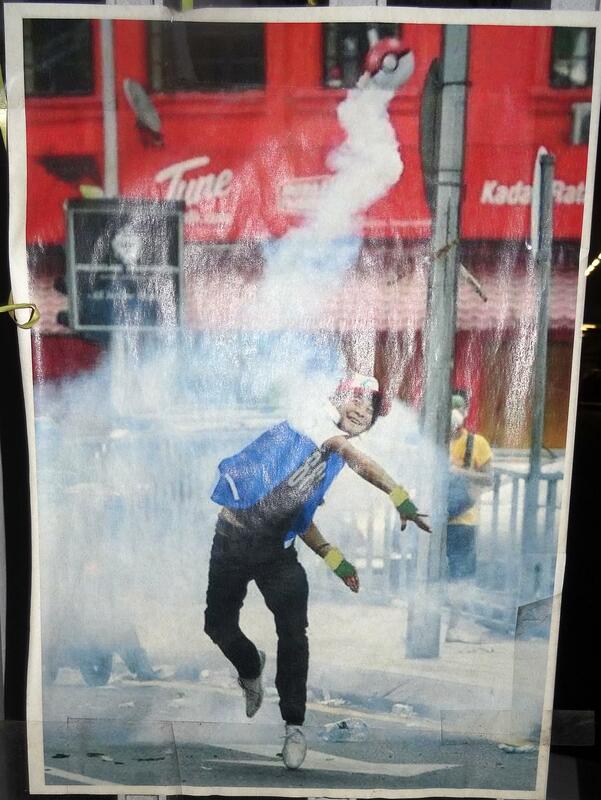 It was pepper spray and batons against construction helmets and shop goggles. The police forced the protesters back from the sky bridge leading into the government offices. Retreating demonstrators piled debris in the escalators to keep them out of the main protest camp below. There were forty arrests and several injuries. Government employees came in late through the unblocked routes. A hand-drawn Pikachu looked on at the chaos. It was taped to a nearby column, sun-bleached and curling from exposure to the elements. Tears welled in his eyes. November rain squalls made the ink run. 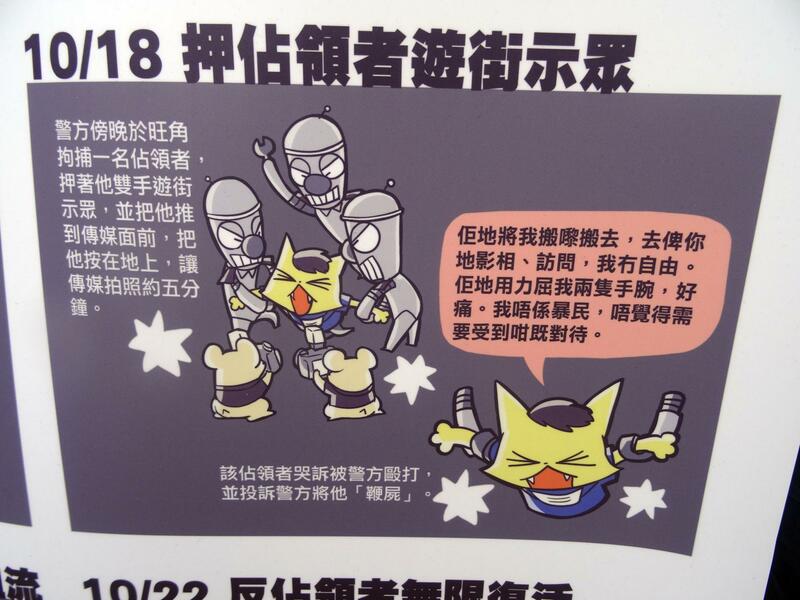 One doesn't think of Pikachu as a political figure, but he wasn't alone. 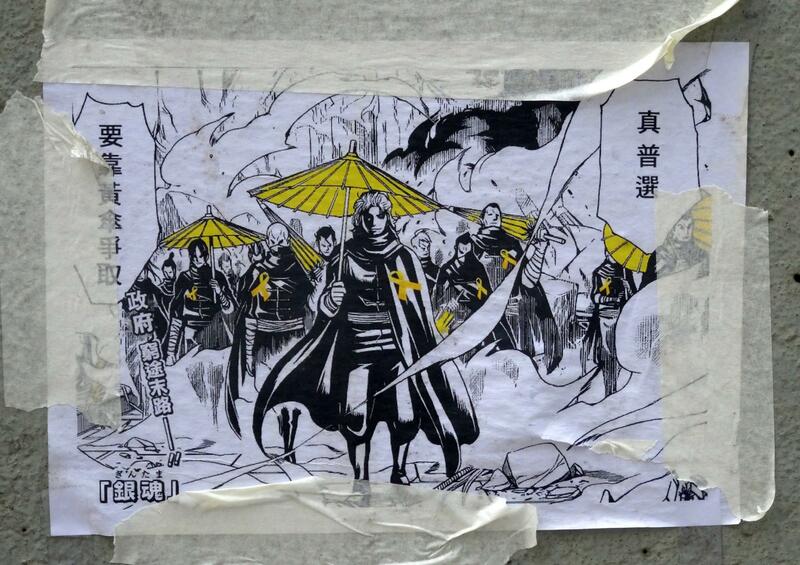 Geek iconography covers the Occupy Central encampments. Video games, manga and internet memes merge into a unique youth language that speaks through installation art and graphic design. 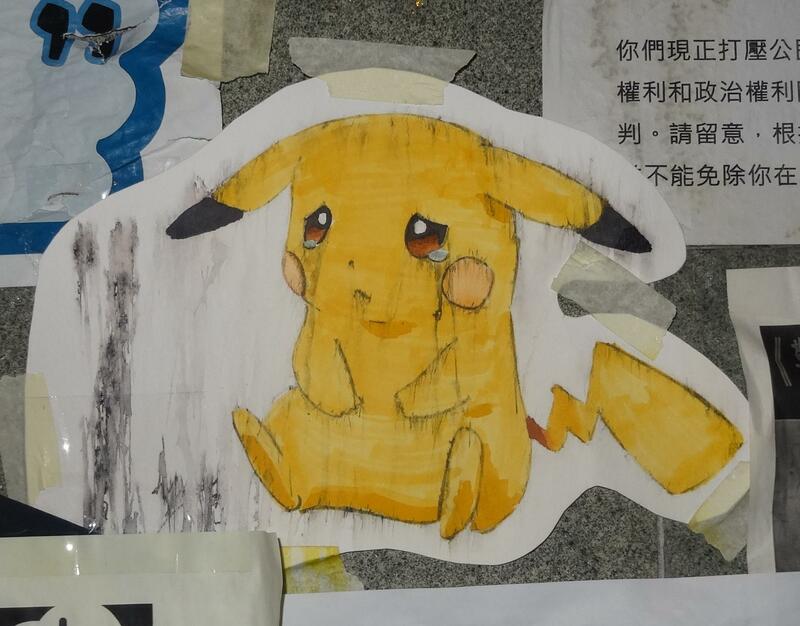 I went down to Admiralty with a notebook and camera, wanting to document as much as I could before the rumored police clearance tore it down. The movement's camp stretches along Connaught Road. Hundreds of tents line the eight-lane road, arching up an overpass. Barricades made from bamboo, wooden pallets and metal gates cap each end. The protesters are organized. A supply depot in the center accepts, organizes and distributes donations. First aid stations appear every few hundred feet. Street medics lounge outside, helmets with red tape crosses dangling from their hips. A few lingering patients have small bandages on their scalps. They expect trouble, because the donation sign outside reads NEED MORE HELMETS. Everyone's napping after last night's clashes. 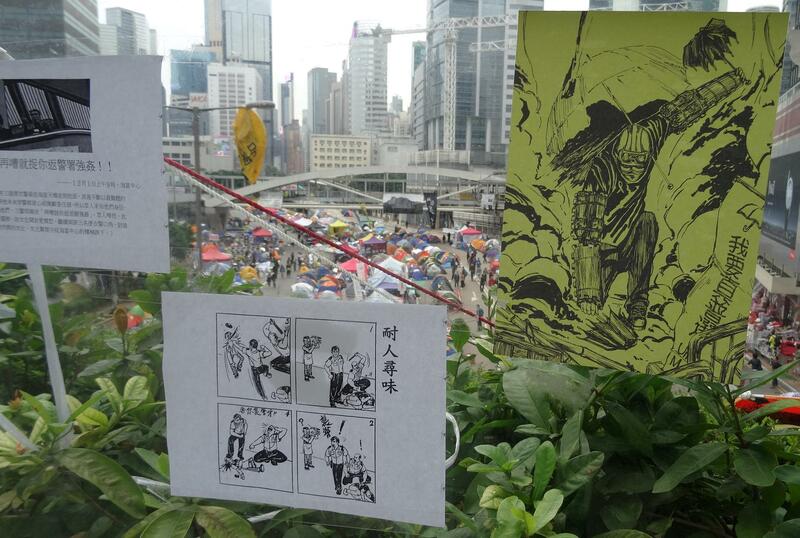 The tent has a piece of umbrella movement art on it -- Totoro with a yellow umbrella, shielding protesters. The term "umbrella movement" began during the September clashes, when police deployed pepper spray and tear gas against demonstrators. 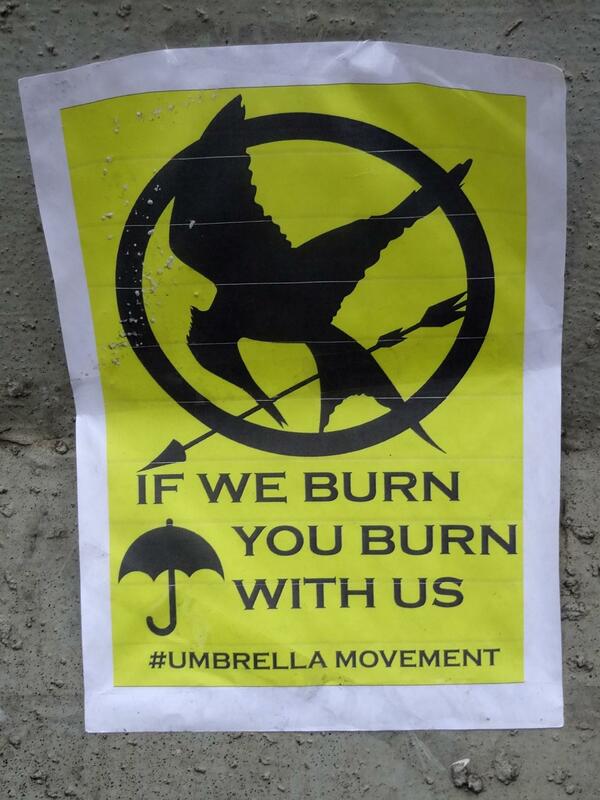 Protesters responded with a wall of umbrellas to shield themselves without breaking ranks. 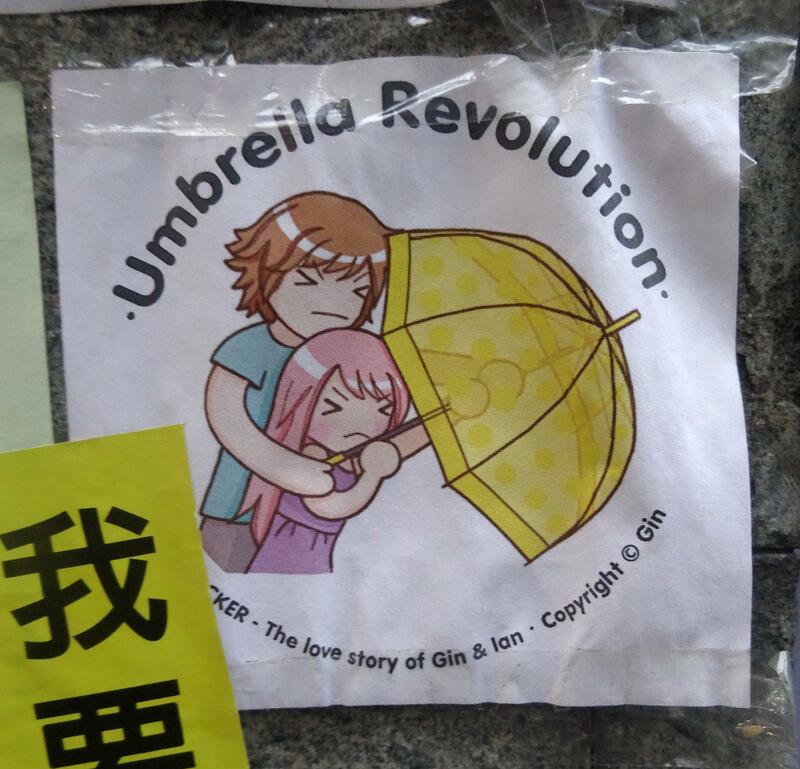 With the umbrella established as the movement's quintessential sign, protesters started appropriating characters associated with umbrellas as unofficial mascots. Totoro is the most prominent example, but you'll also find Mary Poppins and Paddington Bear -- doubly subversive because they speak to the city's British heritage. 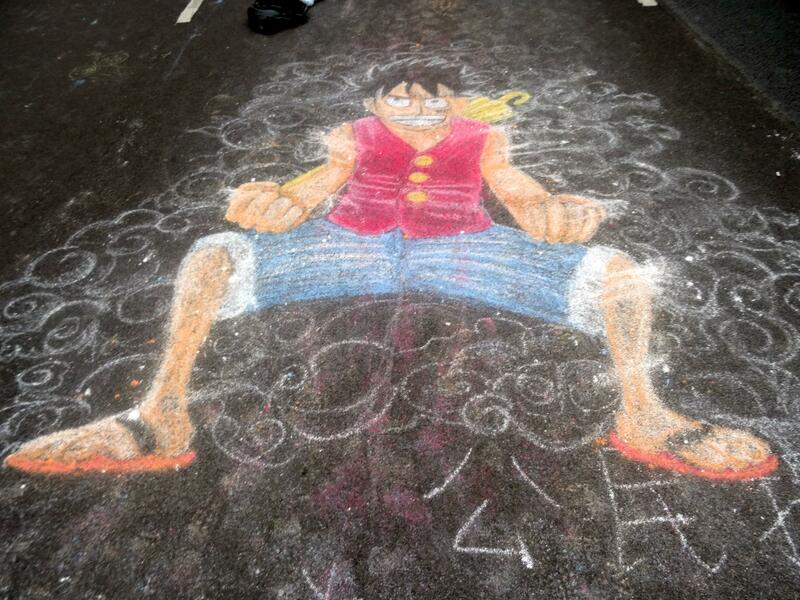 Doraemon makes the cut with a slight alteration, the propeller in his head swapped out with a yellow umbrella. To highlight the movement's nonviolent philosophy they choose characters that are firm, but aren't aggressive. There's no implicit threat in cartoon characters. Artists aim for resolute cuddliness. 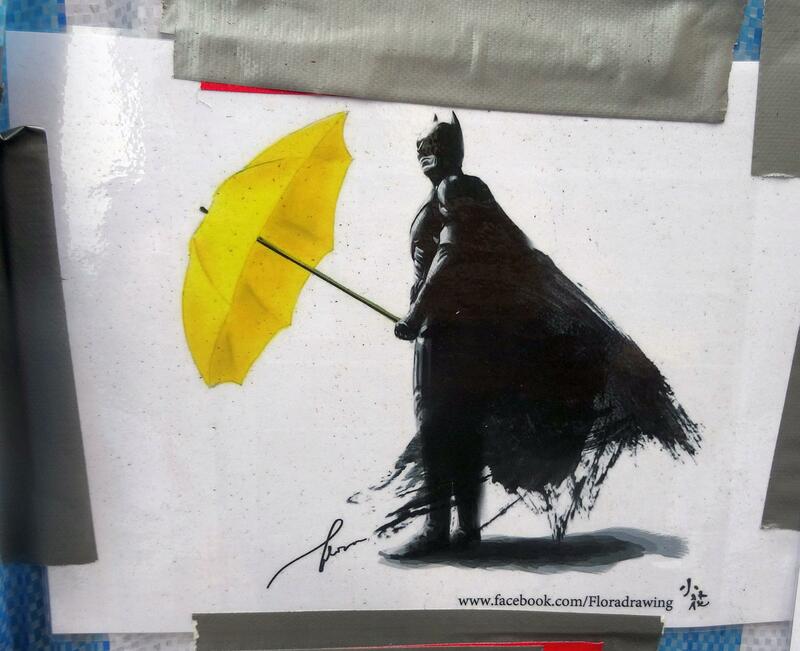 Another series takes the opposite tack, presenting famous political leaders and pop culture figures wielding umbrellas rather than weapons. Bruce Lee and Winston Churchill stand beside Hulk and Thor, either in defensive or action poses. Captain America makes an appearance, a reference to a protester who showed up to the protests dressed like him (not the best message, as Beijing insists the protests have U.S. backing). Mash ups happen as well, with history and media intermingling. 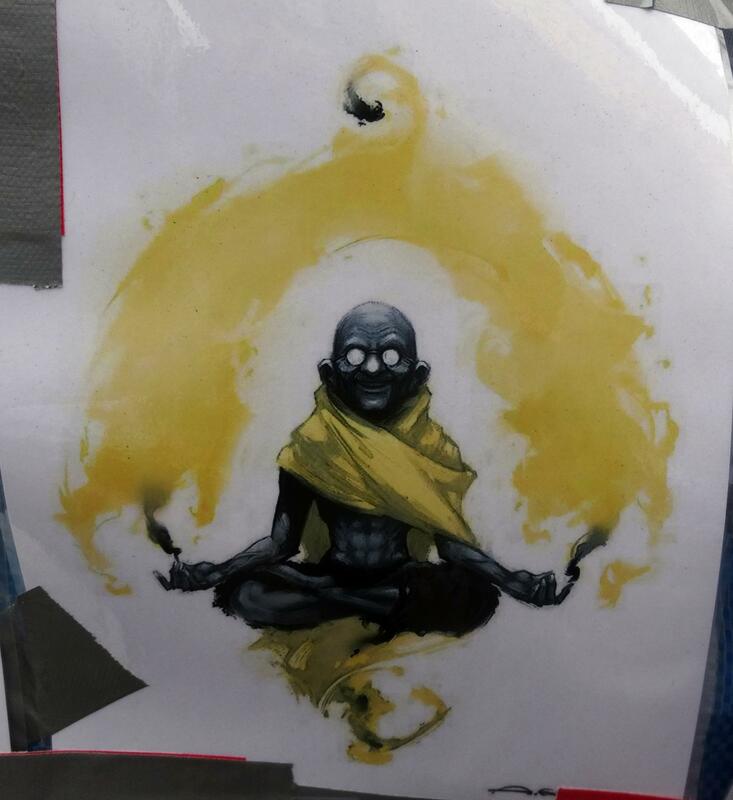 Gandhi floats cross-legged looking much like Dhalsim, projecting a fiery umbrella above his head. 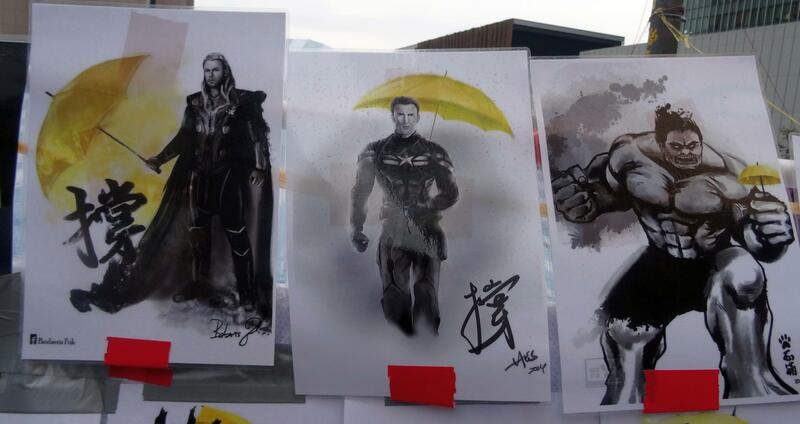 When the umbrella appears in the hand of superheroes or historical figures it serves to encourage the protesters, emphasizing their strength and power. At other times -- when Vladimir Putin or Kim Jong-un hold one -- it's an ironic swat against undemocratic leaders. In both cases, it manages to communicate potency and fortitude while neutralizing violent imagery.